NC Issues New Stormwater Permit — Wetland Studies and Solutions, Inc.
New North Carolina NGC01 Issued! The North Carolina Department of Environmental Quality (DEQ) has issued the new NCG01 permit, which applies to projects that are subject to both the federal Clean Water Act and the NC Sediment and Pollution Control Act (SPCA). All construction activities with an Erosion and Sediment Control (E&SC) Plan approved after April 1, 2019 must use the revised permit process that revolves around the new Electronic Notice of Intent (e-NOI) and Certificate of Coverage (COC). View the final NCG01 Permit here. Electronic Notice of Intent (e-NOI): on-line NCG01 application form. Certificate of Coverage (COC): project-specific approval that indicates coverage under the NCG01. Projects with an existing E&SC Plan are likewise bound by the new permit and should have both the permit and standard detail sheets on-site, but do not need to retroactively complete the new NCG01 permit process. The required inspection frequency is once per 7 calendar days, and within 24 hours after a storm with greater than 1.0 inch of rain. This is an important change because the inspection threshold was previously 0.5 inch. When a storm event with rain equal to or greater than 1.0 inch occurs outside of normal business hours, the inspection shall be performed on the next business day. Under the new permit process, you may begin land disturbance after receipt of the COC, which the Department of Energy, Mineral, and Land Resources (DEMLR) will issue within three days of receiving your e-NOI. Please note there is no grace period for either new projects or existing projects – all projects must adhere to the new NCG01 permit beginning April 1, 2019. Although DEMLR is not initially charging an annual fee for the COC, they will begin charging a $100 annual permit fee on or around June 1, 2019. You can learn more about the new NCG01 permit on the North Carolina DEQ Construction Stormwater website, where you can also track the progress of the NCG25 permit – which applies to projects that are only subject to the Clean Water Act, and not subject to the NC SPCA. We discussed the NCG25 permit in our January 31, 2019 issue of Field Notes. North Carolina DEQ anticipates releasing a draft of NCG25 by April 30, 2019, with the final NCG25 expected August 1, 2019. 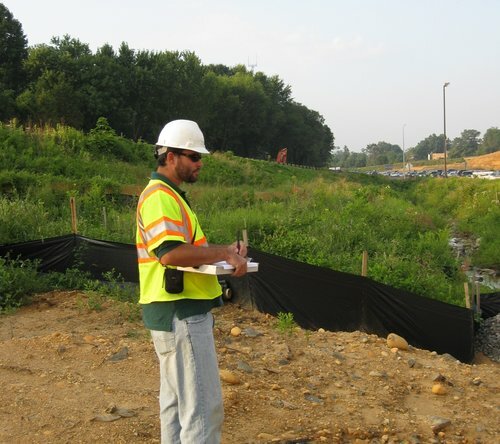 Wetland Studies and Solutions can help you navigate the new NCG01 permit process, assist with submitting your e-NOI, and perform the required site inspections to help ensure your project remains in compliance with the NCG01 permit. If you have questions about North Carolina construction stormwater permitting, please contact Bryce Miller or Drew Hatley to discuss how the new NCG01 permit and upcoming NCG25 may affect your current and future projects.